CCO became a nonprofit on March 29, 2018. The IRS determination letter dated August 2018 recognizes Community Compassion Outreach (CCO) as a 501(c)(3) public charity. 2018 Form 990 Download file (see box at left). ​(NOTE: CCO started as a church program in January 2017 and has evolved into a more effective organization since our nonprofit status was determined). To obtain additional information, please contact us here. Community Compassion Outreach is made up of concerned individuals, faith & nonprofit groups, and local/state/national organizations working together to craft permanent & real solutions to end homelessness. HUD Balance of State, 2017 Homeless Point-in-Time Survey in La Plata County indicates 91 homeless with 35 unsheltered. These numbers do not account for couch-surfers, people hiding in difficult to reach spaces, those sleeping in vehicles, etcetera. CCO is committed to fostering personal responsibility, independence, self-governance, and the life skills necessary for people to move out of unstable living situations and into brighter futures. 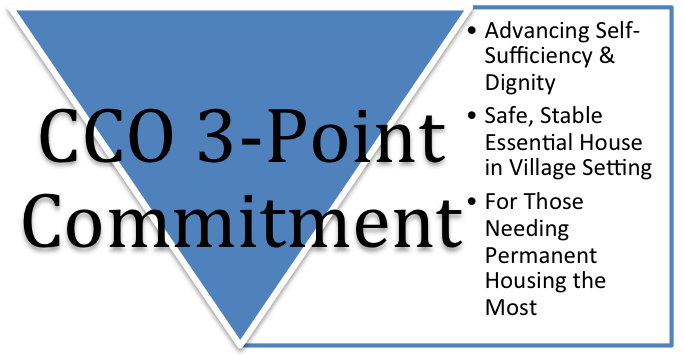 Homes provided through CCO will be compact, safe, durable and functional. Residents will be involved in the operation and maintenance of the community with oversight and support provided by CCO. CCO will serve those with very low incomes that are currently unable to access affordable housing. HHI Essential Homes - 480-520 sq.ft. with shared resources and common facility to support village with one, two, three and four bedroom units for more than 60 homeless households. SELF-GOVERNANCE - Involvement of residents in decision-making and management. COMMUNITY AGREEMENT - A basic code of conduct by which residents would abide. Thank you for your tax deductible Giving! All rights reserved. Copyright 2018. Community Compassion Outreach, Durango, CO 81301.